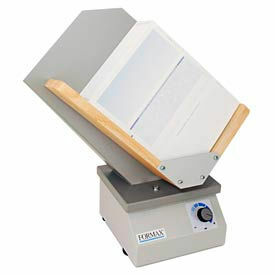 Joggers Help Align And Separate Forms, Paper Or Envelopes For Accurate Feeding. Joggers are made of metal and plastic for long lasting durability. Process one-piece pressure-sensitive mailers. Reduce heat and static electricity caused by laser printers. Joggers with Bins feature variable speed dial with solid state control for up to 4,000 vibrations per minute. Electromagnetic design allows continuous operation. High Capacity Air Jogger helps align, dry and remove static electricity in one step. Air pressure, timed jogging and foot pedal control makes this unit easy to use in print shops and production houses. Tabletop Paper Jogger and Heavy Duty Paper Jogger helps eliminate static electricity and paper sticking to help prevent jamming. Great companion for high speed copiers, folding machines, printing presses, cutters, and perforators. Types are Heavy Duty Bench Paper Jogger, High-Capacity Air Jogger, Single Bin Paper Jogger, Tabletop Paper Jogger, Three Bin Paper Jogger and Two Bin Envelope Jogger. Sheet capacities are 800 Sheets, 940 Sheets, 1,700 Sheets and 1,750 Sheets. Color is Gray. Sizes vary per type. 3 Month Limited Warranty on Formax models. 1 Year Limited Warranty on Martin Yale® model.